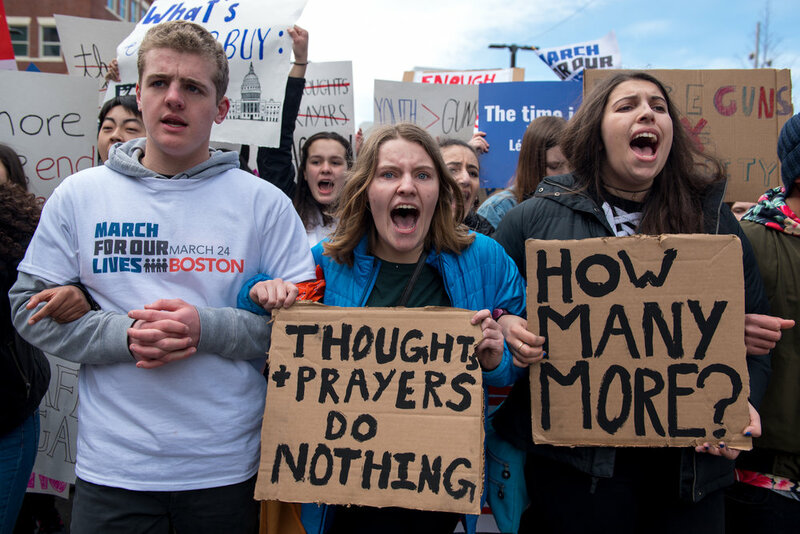 Thousands of young people from across the United States participate in March For Our Lives in response to the Marjory Stoneman Douglas High School shooting in Parkland, Florida. Seventeen year old Chloe Janes links arms with peers at the front of the march in Boston. 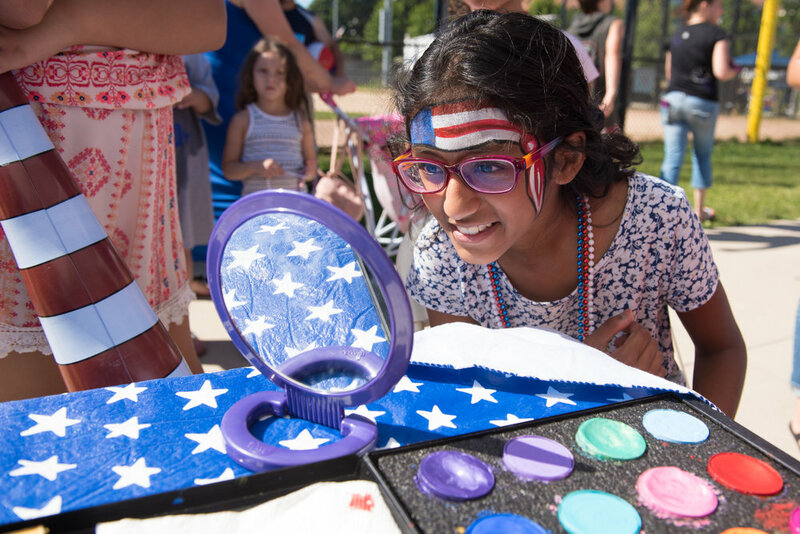 Marwah Syad replaces her glasses upon competition of her American flag face paint to take a closer look in the mirror during Everett’s Independence Day festivities. Behind the scenes, Katie Duncan fixes her hairpiece while standing within a shipping container in the Port Park parking lot as she transforms into Mustardseed for a production of A Midsummer Night’s Dream. Duncan, a theatre student at Emerson College, is one of several performers in the outdoor Shakespeare production. Marla Brodsky and her team of Alaskan Huskies from Hilltown Sleddogs train in Western Massachusetts for the upcoming 250 mile Can-Am Crown International Race in Maine. Near the completion of its construction, Encore Boston Harbor is fully illuminated for the first time on a Tuesday evening. The casino prepares to open in June 2019. Congress candidate Ayanna Pressley speaks to an enthusiastic crowd of supporters outside of the polls in Chelsea, Massachusetts on election day in her race against incumbent, Congressman Mike Capuano. 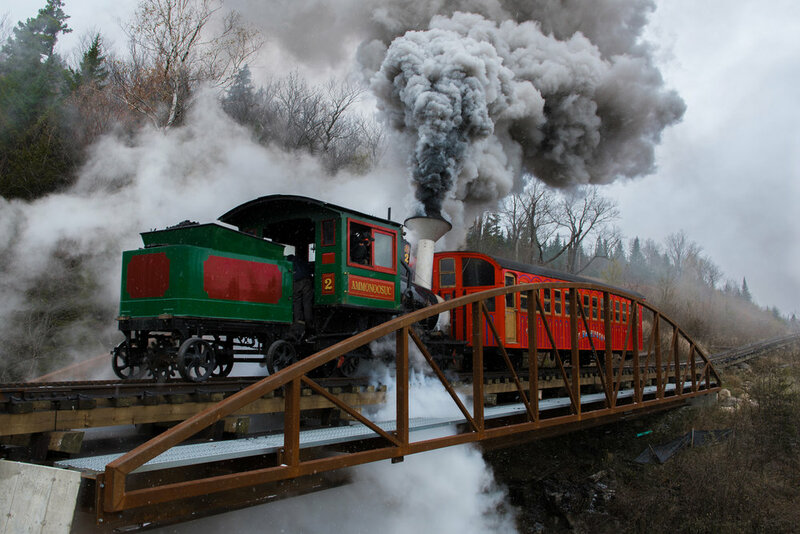 Loaded with passengers, the final steam engine of 2018 makes its way up to Mount Washington from the Cog Railway Station in October. Below zero temperatures freeze the steam during colder months, making the journey impossible to continue throughout the winter. Hundreds participate in a polar plunge at Short Beach on New Year’s Day in memory of Michele Durgin, a Lynn teacher who was killed in an automobile accident. Sal DiDomenico wraps a ribbon of money around the statues of Saints Cosmas and Damian in front of his home and flower shop on Cambridge Street. Family and friends drop confetti, ribbons, and money sheets from the windows behind him. Karina Cuello checks in on her kitten, Chu Cho, while waiting in line at a vaccination clinic in Voke Park. Vaccines and microchips are provided to Chelsea residents on behalf of HubCats Chelsea and the MSPCA. Thousands of dead fish wash up in Everett along the Mystic River between Costco and the Encore Boston Harbor construction site. Officials determine the scene is a result of natural causes. Happy Haunts come out to socialize on the grounds of the Haunted Mansion attraction in Walt Disney World’s Magic Kingdom during Mickey’s Not So Scary Halloween Party. Student, Anthony Amico, is invited to join The United States Army Field Band during a public performance in the Everett High School auditorium. 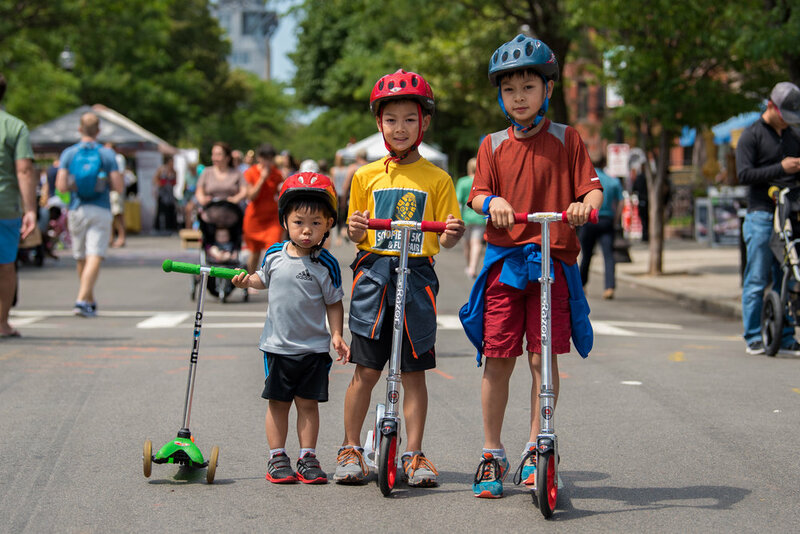 The Chen brothers, Adam, Lucas, and Jason, enjoy the open space on Newbury Street, relishing in the opportunity to use their scooters without the worry of traffic during Open Newbury Street. Small business owner, Angie Hill Yu, demonstrates how she creates handcrafted jewelry in her basement studio. Yu was inspired to incorporate jade into her pieces when she married into a Chinese family. Over five hundred kids make a splash at Carson Beach during the Save the Harbor / Save the Bay Youth Beach Bash. Following a countdown, kids bolt towards the ocean. Michael King, a member of the Junior Police Academy, adjusts a telescope to get a better view of Black Hawk Helicopter landing in Glendale Park. The Everett Police department arranged for the National Guard to allow kids to get close up with the military aircraft. Teams from Revere and Charlestown face off on the ice at Lake Winnipesaukee in a fierce ice hockey competition. Thousands of players from the United States and Canada congregate to play amidst the scenic backdrop. Rev. Tammy Thurman-Brown sways to gospel singing at the annual Martin Luther King Jr. Day breakfast in the Everett Connolly Center. A homeless man please for help with a cardboard sign outside of Stop & Shop in Everett. Meanwhile, the Metropolitan Area Planning Council addresses food insecurity issues in the city.